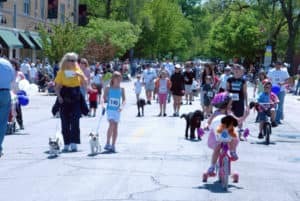 Saturday, May 19 is the return of the annual Spring Road Pet Parade! This is a fun event for all the members of your family, human and animal alike. Enjoy seeing pets of all kinds in the parade. If your pet participates, they could win prizes for obedience, best costume, best grooming or oldest animal. The Spring Road Pet Parade includes lots of activities, including a moon jump bounce house, temporary tattoos and pet trick demonstrations. Although the Spring Road Pet Parade is free, all of us at Elmhurst Toyota encourage you to make a monetary or non-perishable food donation to benefit the Yorkfield Food Pantry. Festivities begin at 11:30 a.m. in Jack’s Silverado Grill parking lot. Enjoy the moon jump bounce house, watch the Most Original Pet Trick Contest, and even get a magnet with your pet’s photo. The Silverado Grill is open for lunch beginning at 11:30, although we don’t recommend trying out the bounce house immediately after eating! All species and breeds of animals are welcome, provided they are healthy and well-behaved. The parade begins at 1 p.m. and pre-registration is recommended. If you’d like to show off your pet’s tricks, you can register for the Most Original Pet Trick Contest at the same time. Registration can be completed online at https://bit.ly/2KUHTsa. A free goody bag is included with your pre-registration. You can also register onsite on May 12. The 1 p.m. Spring Road Pet Parade begins from the Silverado Grill parking lot and proceeds south on Spring Road. At Prairie Path, the parade turns back toward the Silverado Grill and ends in the parking lot. The Most Original Pet Trick Contest is just after the parade. Onsite pet adoption is also available! This free, family event is brought to you by the Spring Road Business Association and the Kiwanis Club of Elmhurst. You don’t want to miss the 2018 Spring Road Pet Parade! Registration and activities begin at 11:30 a.m.
Pet parade begins at 1 p.m. The Most Original Pet Contest Trick begins immediately after the pet parade. Free. Cash or non-perishable goods will be accepted to benefit the Yorkfield Food pantry.